You need to complete the material from Tuesday's class. This means you need to read an article on the Coriolis Effect, watch 2 video clips, and play a flight game. You will begin the Investigating Currents Activity tomorrow. You did not meet for class today due to ISTEP testing. You will begin the Investigating Currents Activity tomorrow. 1. Start Investigating Currents Activity. 1. Review Coriolis Effect reading, videos, and flight game. 2. Reading selection only on the Coriolis Effect. I would HIGHLY suggest you watch the two video clips below. I would HIGHLY suggest you try and fly the plane too. 3. Homework: If you do not finish the reading selection, you will need to read it tonight. I plan on having a WONDERFUL, insightful, and engaging conversation about this reading tomorrow. As you recall, the better the discussion, the more hands-on activities/labs I will do with you. Dull conversation means I do not do activities/labs with you. a. What do you think causes ocean water to move? b. How do you think water gets into and out of the water? c. What do you think causes wind? d. What is the Coriolis Effect? e. Earth is tipped at what axis angle? g. What does part per million mean? h. What is the average temperature of the Atlantic Ocean? 2. Mini activity. Describe a heat reservoir as demonstrated in class. 1. The My Big Campus assignment from Tuesday was due at 7:30 a.m. today. If you forgot to complete the assignment on Modern Day Classification then you can complete the assignment for 1/2 credit. 2. Practice Quizzes that you MUST email me. After you click submit, you will need to email me the quiz. You need to email me all three section quizzes. My expectation is that you will score a "B" on each quiz. The email you need to use is lori.young@evsck12.com. 3. HOMEWORK: Study for tomorrow's test. The text covers Chapter 17 in the blue book, which is the pdf file below titled "adptationsovertime.pdf"
1. Practice Quizzes. You MUST take enough quizzes to answer 50 questions. Yes, I know there are a lot of questions but you can choose the ones you want to do. Yes, I know you probably don't want to do them. Yes, I am expecting you to do enough quizzes that you answer 50 questions - the more you practice, the better your score on the test. Get this! You can do ALL of the questions if you would like. I don't have a problem with it. Tuesday, April 28, 2015 ALL CLASSES! 1. Collect worksheet from people who were absent yesterday. b. What is the modern day classification system starting from Domain down to subspecies? 3. HOMEWORK #1: Sorry about the delay of posting this homework. I originally was going to assign you an Achieve 3000 article, but I found a better article. The reading selection is on TAXONOMY. This assignment is due by THURSDAY morning on or before 7:30 a.m. This reading selection is found on My Big Campus under Schoolwork. 4. HOMEWORK #2: Fourth and Final Virtual Snow Make-up Lesson. This is also a reading article, but I used Google quiz. The snow day article is on evolution. 1. Collect the online lab titled "How Can Natural Selection Be Modeled"
2. Assign the worksheets over Adaptations Over Time. Now, many of you started this assignment in class. You were reading from the blue textbook. You still need to finish this assignment. I have posted the SAME exact chapter below. The only thing that is different is the page numbers. This chapter is below and is titled "adpatationsovertime.pdf"
﻿FOURTH and FINAL Virtual Snow Make-up Lesson. 1. Quiz. The quiz is on My Big Campus under schoolwork. The quiz is only over the five vocabulary words from Tuesday's class. 3. HOMEWORK: The third virtual snow day make-up lesson is due by Monday, April 27 before 7:30 a.m.
2. Turn in your activity from yesterday. This activity was about natural selection. 3. Read pages 172 - 175 in the online text titled "adaptationovertime.pdf" This file is located right below the homework for today. While you are reading, I want you to complete the comprehension worksheet. I will give you a copy of this worksheet in class. If you have lost your worksheet, you can print another one off or you could write the answers on a sheet of lined paper! 4. HOMEWORK: The third virtual snow day make-up lesson is due on Monday, April 27 before 7:30 a.m.
Period 1 and 2 ONLY: Please go and recycle the worksheet I gave you. There are too many glitches with the online activity. I'm not willing to "battle" the glitches and do not want you to do so either. I will get you restarted tomorrow. Periods 5, 6, and 9: You will start on today's assignment. You will need to go to this website to complete today's assignment. I will give you time tomorrow to complete this assignment; however, your assignment will be due at the END of tomorrow's class. 2. Class Discussion over the reading and vocabulary. If the discussion goes well, which means EVERYONE actively participates in the discussion, I will cancel the reading comprehension packet. Obviously, if discussion doesn't go well, you will receive a packet of work to complete over the reading and vocabulary from Tuesday. 3. HOMEWORK: Complete the third snow day virtual make-up assignment. The third lesson is due by Monday, April 27 no later than 7:30 a.m.
1. O.K. So, I goofed up yesterday and assigned you a phylogenic tree instead of a cladogram. Why? Couldn't tell you. Let's go over JUST the data table. 2. HOMEWORK: Read pages 165 -171 in the online textbook titled "adpationsovertime.pdf" AND define these words: Sedimentary rock, radioactive element, embryology, homologous, vestigial structures. Include the reading page that the definitions are on! 3. HOMEWORK #2: Complete the third virtual snow day make-up lesson. This lesson is due Monday, April 27, 2015 by 7:30 a.m.
Monday, April 20, 2015 . . . Read the homework part since I've change the homework assignment! 1. Complete a cladogram based off last week's data table. 2. Practice another cladogram in reverse. I will give you the cladogram, then you will make a data table from the cladogram. 3. HOMEWORK #1: O.K. I have to change my expectation for tonight's homework. I want you to do THREE things -- make a data table, fill in the animals and characteristics, and then make "X's" where they belong. Please do not . . . DO NOT. . . complete the actual cladogram. I gave you a cladogram that is a bit too complex for what we covered in class. You don't even have any notes over this type of cladogram. So, we will do the cladogram tomorrow in class. This is the THIRD lesson. For this lesson, I want you to complete another cladogram! You will pull up the quiz by clicking on the link. You should see a cladogram at the top of the quiz followed by 10-questions. The first three questions are super easy - first name, last name, and email address. The remaining questions are about the cladogram. Again, the cladogram you are to use is on the quiz document; it is on the top of the quiz. 3. HOMEWORK: Finish second virtual snow day makeup lesson. This lesson is due by Monday, April 20 no later than 7:30 a.m.
2. HOMEWORK: Study for tomorrow's quiz. The quiz is over the seven vocabulary words and the reading. All seven vocabulary words will be on tomorrow's quiz. I will then select three more questions for you to answer. 3. While you read, you need to define the following words AND write down the exact page you found the definition in the reading: species, evolution, natural selection, variation, adaptation, gradualism, punctuated equilibrium. You ALSO need to complete the worksheet! 4. HOMEWORK: Finish reading,vocabulary, and worksheet. 2. HOMEWORK: Graph Owl and Mice Data. You will make a double-line graph using the second and third columns of your data sheet. Plot ALL of the mouse data first and connect the dots. Now, plot ALL of the owl data and connect those points. Once you have your data table complete, you need to complete the analysis/conclusion questions on the back of the graph paper. This assignment is due at the start of class tomorrow. I will NOT give more time for you to finish the assignment. If you forgot to take home this assignment, you can print it off at home. You want to print pages 4 and 7 of the pdf below. By next Monday, April 20, you must complete the adaptations reading assignment. You MUST use your EVSC google email account. If you plan to use a different email account, you need to let me know BEFORE Friday. (I will have to grant you access if you use a non-EVSC Google email address.) You will need to read the article provided and answer the questions that follow. This assignment MUST be completed online. Just make sure you click on SUBMIT at the end of the reading/questions. 3. Open Google Doc, make a copy of it, work with partner to complete data table. 4. HOMEWORK: Only virtual snow makeup lesson. 2. HOMEWORK: NONE, except for you Virtual Snow Makup assignment. 2. Review Guide: Practice Test A. Complete questions 1, 2, 4, 5, 6, 7, 9, 10, 11, 15, and 19. This is NOT an online test. You will need to scroll down to Monday, April 6. I posted this practice test as a pdf file. 3. Review Guide: Practice Test B. This test/quiz is online. It will give you immediate feedback, so you will be able to see how well you are studying. 4. Review Guide: Practice Test C. This is another online test/quiz. It only has three questions which are located on the right of the screen. The more practice you do the better your actual test score. 5. Review Guide: Practice Test D. This is yet another online test/quiz. Yes, you do need to complete it. Take this quiz and see how you are doing. 6. Review Guide: Practice Test E. This is the LAST practice quiz. It is longer than the rest of the other online practice tests, but I do expect you to do this quiz. We have covered almost all of the questions so you shouldn't have too many problem. 7. HOMEWORK: Study for the Punnett Square test tomorrow. The test will be online so this means it will be multiple choice. You will need to complete a variety of Punnett squares, calculate percentages, know definitions (homozygous, heterozygous, dominant, recessive, allele, genotype, phenotype, etc. ), and be able to read a selection I give to you. 1. Finish Beaker Babies. Your beaker baby is due by the START of tomorrow's class. 2. Review Guide: Practice Test A. Complete questions 1, 2, 4, 5, 6, 7, 9, 10, 11, 15, and 19. 3. HOMEWORK: Your beaker baby MUST be done by the start of tomorrow's class. I will not be able to give any more time in class. By next Monday, April 13, you must complete the genetics review worksheet. There are three sections to complete on this worksheet. The first section is to identify if a given genotype is homozygous or heterozygous. 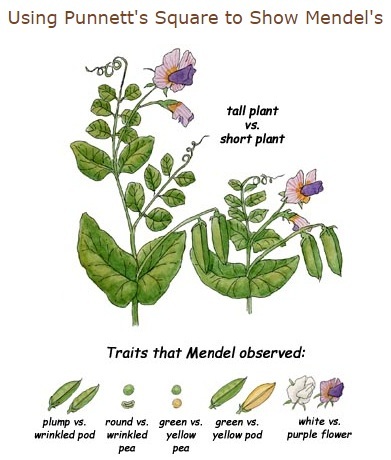 In the second section, you must determine the phenotypes. The last section requires you to solve five story problems.Now, there are several ways you can complete this assignment. You could . . .
2. HOMEWORK: NONE, it looks like I will need to give you class time on Monday to finish this assignment. 1. Continue working on Beaker Babies. I want to collect this assignment at the end of Friday's class. 1. Continue working on Beaker Babies. If you need a another copy of it, please look at Tuesday's lesson. 1. Turn in Punnett Square/Insect Activity. 2. Begin Beaker Babies. You will probably only get the front side of page 1 completed during class. Please do NOT work ahead. I've just had too many students "goof" this activity up, which creates frustration. 2. Complete Punnett Square and Insect Activity. It is posted below the homework assignment. 3. HOMEWORK: Complete the Punnett Square and Insect Activity. It is due tomorrow. I will not be able to give you time in class to finish it. We MUST start beaker babies! 1. Finish working on Virtual Lab: Flies. Remember you have several ways to complete this assignment. You could print your own document and finish it, you could write the answers on a sheet of paper, or you could even complete the assignment using google docs. 2. HOMEWORK: NONE. Have a great spring break. 2. Complete new virtual lab on flies. This lab is a bit more complex than the monster activity, but I know you can still do it. On the first page, you will find the directions on how to complete the activity. The next pages are where you record your data. Now, there are several ways you can complete this assignment. a.) You could print out the document on your own printer and complete the assignment. part that reads Virtual Lab: Flys. 5.) Close the original document you opened because that one is mine. c.) You could open the document and write your answers for pages 2-5 on a sheet of paper. 3. HOMEWORK: None. I will let you work on and finish this assignment tomorrow during class. 2. Achondroplasia practice problem. Write in your notes. 3. VIRTUAL LAB. Complete the virtual lab. 2. Tomorrow, you will finish notes over Punnett squares. 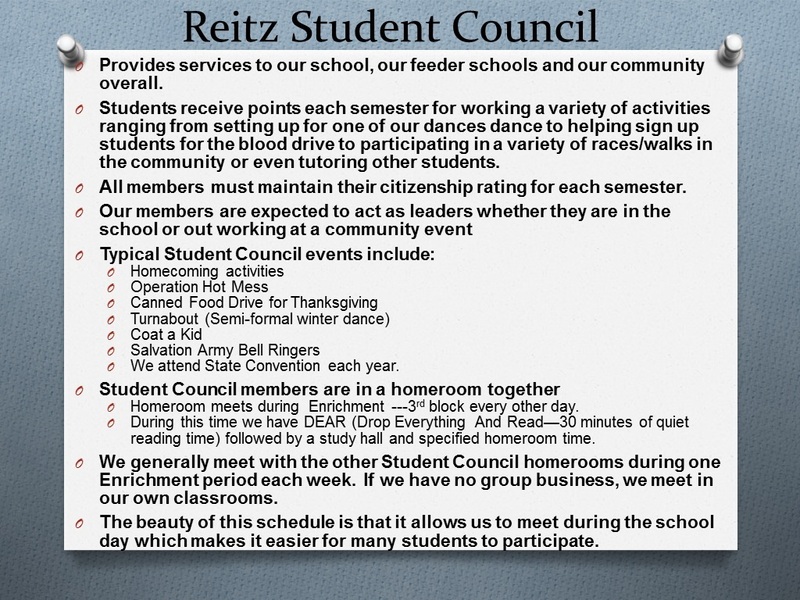 OTHER: If you are interested in joining student council at Reitz next year, you need to fill out the form ASAP! You should join student council even if you were not on student council here at Perry Heights. The form as a due date on it that has passed, but do not worry! You need to have the form filled in and turned in this week. I would suggest no later than Wednesday. Below it the overview of student council and the application form. 2. Punnett Square Practice. Complete worksheet given to you by your teacher. If you lose it there is a pdf of it below. It is titled guaranteed_seed.pdf. 2. HOMEWORK: HOMEWORK: Achieve 3000 Article. Complete the article titled "Wolves in Dog's Clothes." IF you have an official achieve account you should use your account. If you do not have an account, please log in to My Big Campus -- Schoolwork; it is posted there. This article is due TOMORROW (March 12) by 7:30 a.m.
2. HOMEWORK: Achieve 3000 Article. Complete the article titled "Wolves in Dog's Clothes." IF you have an official achieve account you should use your account. If you do not have an account, please log in to My Big Campus -- Schoolwork; it is posted there. This article is due THURSDAY, March 12 by 7:30 a.m.
1. Go over last Tuesday's homework assignment. 3. HOMEWORK: Achieve 3000 Article. Complete the article titled "Wolves in Dog's Clothes." IF you have an official achieve account you should use your account. If you do not have an account, please log in to My Big Campus -- Schoolwork; it is posted there. This article is due THURSDAY, March 12 by 7:30 a.m.
3. Answer these questions in your science journal. Yes, you may type these answers if you prefer. d. What happens if you move the slide toward you if it is on the stage and you are looking through the eyepiece? e. What happens if you move the slide to the left if it is on the stage and you are looking through the eyepiece? What about to the right? 1. Discuss homework from yesterday. 3. Illustrate the slide on medium power and high power. You are to label the following organelles: nucleus, cytoplasm, cell wall, cell membrane, and vacuole*. * Sometimes, the vacuole isn't easy to find in the cell. 1. Finish illustrating the onion cell. 2. Complete analysis/conclusion in your science journal. a. Based on your sketches, what are onion cells made of? c. How can you tell where one onion cell ends and the other begins? e. Did the onion cells you observe have chloroplasts? Explain. f. Who is Robert Hooke? Why is he important in biology? examined the top and bottom of a spinach leaf. 4. HOMEWORK: Finish onion cell conclusion questions. Due tomorrow. a. Make a spinach leaf imprint of the top of the leaf and of the bottom of the leaf. A. Complete the analysis/conclusion for tomorrow's class. You will NOT receive work time at the start of class. You can either MAKE A COPY of the google docs to complete this work or you may write your answers in your science journal. 1. What is the function of the stomata? 2. How many guard cells are outside the stomata? 3. What do guard cells do for stomata? Why are guard cells needed for stomata to work properly? 4. Which side of the spinach leaf has the most stomata? Why is that? 5. Write the chemical equation for photosynthesis. Label the reactants, the products, and the yield sign. 6. When does most photosynthesis take place? Day or night? Explain. 7. Why are stomata open when plants are photosynthesizing? 9. When does plant respiration typically take place? Day or night? Explain. The __________________ of this activity was to ____________ which side of the spinach leaf has the most stomata – the top or the bottom. Spinach leaves packaged by _____________ were sampled. Stomata are _____________ in the surface of the leaf. The pore is surrounded by two _____________ cells. When these two guard cells take up _____________, they ____________ and open up the pore between them. When these guard cells begin to ____________ water, they _____________ back, and the pore closes up. It is a water saving ______________of the plant. Therefore, based on the _____________ collected, the _____________ of the leaf has more stomata than the __________ of the leaf. B. HOMEWORK: Finish analysis/conclusion questions. times you practice, the better off you will be for Friday's test. 3. HOMEWORK: Complete online practice quiz 4 times by 7:30 a.m. tommorrow. 3. HOMEWORK: Study for Friday's test. 1. Clean microscope slides/cover slips and return to me DRY! 3. HOMEWORK: NONE, unless you do not finish th reading and vocabulary. The reading and vocabulary is due at the START of class tomorrow! 1. Grade vocabulary from Monday. ﻿﻿2. HOMEWORK: Finish notes on your cell cycle circle. G1: Part of Mitosis? What does G mean? What is going on in the cell during this part? S: Part of Mitosis? What does S mean? What is going on in the cell during this part? G2: Part of Mitosis? What does G mean? What is going on in the cell during this part? 1. Finish taking notes on the cell cycle wheel. a. Notes from last night's homework should ALREADY be recorded on the cell cycle wheel. 2. Practice using Cell Cycle Wheel. You will answer the following questions to see if your notes are quality or not. Here are the questions asked during today's class. a. What are four reasons cells undergo mitosis? b. During ______, the centrioles move towards opposite ends of the cell. c. During ______, the cell is cut in half when the cytoplasm divides. e. During metaphase, the chromatids ______ at the center of the spindle. 3. HOMEWORK: NONE. We will go over even more questions tomorrow during class to see if you have quality notes. 1. Practice Questions using My Big Campus. 2. Expert Groups -- You will be assigned 10-questions to answer for Monday's class. On Monday, you will share your findings with your table mates. Be ready! Everyone in your groups is depending on YOU! 3. HOMEWORK: Finish YOUR 10-expert questions by Monday. You will NOT have time to finish this assignment. Make sure you have finished these 10-questions. Under the expert questions, I have a couple of vidoes for to view on mitosis. Hopefully, these will pull up on your Netbook. 2. Second practice mitosis quiz. By now, you should score 70% or higher on this practice quiz. 3. HOMEWORK: You will be assigned ONE more practice quiz. This quiz will appear on My Big Campus at 2:30 p.m. today and will stay posted until 7:30 a.m. tomorrow. At 7:30 a.m., this practice quiz will disappear. 1. Watch the Ameoba Sisters Mitosis video. This video is located under Friday, January 30 if you want to view it. 4. HOMEWORK: Bring 10 index cards for tomorrow. These index cards will be used for something other than vocabulary. 1. If you chose not to get ahead yesterday evening then you just gave yourself a bit of homework. Define: sexual reproduction, sperm, egg (ovum), fertilization, zygote, diploid, haploid, and meiosis. 2. Begin working on Meiosis Flip Book ... you will complete this flip book with me. 1. Kahoot! game on the vocabulary and the few notes we took on meiosis. 2. Continue working on Meiosis Flip Book. 1. Finished taking notes over meiosis I and II. Below are the notes we used in class in case you missed any of them. 1. Kahoot! game over meiosis notes. 3. Read pdf pages 10 - 15 (pages 104 - 109) in chap04_cell_reproduction.pdf Then answer questions 1, 3, and 5 (pdf page 15 or printed page 109). These questions must be answered by the start of class tomorrow! No excuses since you could download the chapter here at school! 4. HOMEWORK: This will not be available until 2:30 p.m. today! You will be assigned an Achieve 3000 article to complete by FRIDAY. If you have an official Achieve account, you must use it. If you do not have an official account, I will post it under schoolwork in My Big Campus. 1. Go over last night's reading and questions. Collect. 2. Begin Meiosis/Mitosis Project. Instead of giving you a test over meiosis, you will complete a project. This project is due this FRIDAY, February 13 at the END of class. 3. HOMEWORK: Finish Achieve 3000 Article: New Hope for Panthers. Due this Friday! 1. Begin working on the Meiosis/Mitosis Project. This project is due at the END of class on Friday. 2. HOMEWORK: Finish Achieve 3000 Article: New Hope for Panthers. If you have an official Achieve account you should use this account. If you do not have an account, I have scheduled it for you on My Big Campus under schoolwork. Due this Friday! 1. Work Day: Meiosis/Mitosis Project. You will have only ONE more day to work on this assignment. 2. HOMEWORK: Finish Achieve 3000 Article: New Hope for Panthers. Due tomorrow! 1. LAST . . . VERY LAST WORK Day on Meiosis/Mitosis Project. Your project is due at the very end of your science class. 2. After you turn in your project, you will complete a self evaluation. 3. Turn in the project along with the completed self evaluation. 2. HOMEWORK: Take a nap. Read a book. Stay out of trouble. Clean your room. 2. HOMEWORK: Watch Netflix . . . again. Catch up on The Walking Dead or some other show. 2. HOMEWORK: Read a book! 1. Check science grade. I'm hoping that I entered in grades wrong because there sure are a lot of missing student assignments. 3. HOMEWORK: I've reassigned the Achieve 3000 article (New Hope for Panthers). This was the assignment that I assigned on Monday, February 9 and was not due until Friday, February 13. EVERY single 8th grade student has the opportunity to redo (or do for the first time) this assignment by 7:30 a.m. (CDT) on Monday, February 23, 2015. If you like your current score, do NOT redo the assignment. If you do NOT like your score, then take this opportunity and REDO it. You can find this assignment on My Big Campus and on Achieve 3000. 1. Continue taking notes on genetics. 3. HOMEWORK: ACHIEVE 3000: Math + Museum = Fun. This assignment is posted on My Big Campus for those of you who do not have an official Achieve account. Remember that this assignment is due Friday morning by 7:30 a.m. for full credit. 1. Collect personal traits genetic data and record in data table. 3. HOMEWORK: Your ACHIEVE 3000: Math + Museum = Fun article is due tomorrow by 7:30 a.m. if you want full credit on the assignment. 3. HOMEWORK: On printed page 176 (adobe 188), complete questions 1-7. You may type the answers or write your answers on a sheet of paper. We will go over these questions/answers tomorrow at the start of class! 1. Complete questions 1-7 from printed page 176 (pdf 188). Here is the reading selection again. You may type your answers or write your answers on a sheet of paper. We will go over these answers at the start of class tomorrow. 1. Collect substitute assignment. You were to have turned this assignment in yesterday, but I will take it today. 2. Collect the Investigating Currents Activity. This is worth 45-points! You MUST turn it in to me. 3. HOMEWORK: Bring your cell phone to class tomorrow. You will play several Kahoot! games on oceanography. 1. I'm having a sub today. 2. Complete EVERYTHING the substitute gives you to complete. Don't complain about the activity - just complete the activity. Several of you need a REALLY good grade on another assignment. 3. Here are the links you will need to use on the assignment. Part A. www.enchantedlearning.com. There is a Search Enchanted Learning box on this page. You need to use it to find the answers. 1. Activity: Investigating Currents. You should finish collecting data at the end of this class. Period 1 students will finish on Thursday. 1. Activity: Investigating Currents. If all goes well, you should have this activity completed by the end of Tuesday's class. The only students that will not be done are those in first period.